Your pet may come into contact with many diseases during its lifetime, and a good way to prevent some of the most serious diseases is to have your pet vaccinated. 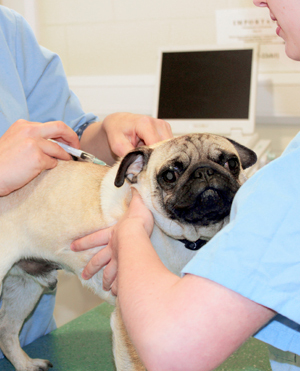 We offer a range of vaccinations for dogs, cats, rabbits and ferrets. Following a full clinical examination of your pet and consideration of its lifestyle (e.g. indoor / outdoor) our veterinary surgeons will advise you on the most appropriate choices. Regular health checks and “boosters” are generally required to ensure that maximum immunity is maintained.